5.0 L - 8 cyl. SUPERBE FORD F-150 XLT ENSEMBLE XTR SUPERCREW BOITE DE 6.5 PIEDS TOUT ÉQUIPÉ WOW! AUTOMATIQUE 6 VITESSE,CLIMATISEUR,GROUPE ÉLECTRIQUE,SIÈGES ÉLECTRIQUE,PÉDALE AJUSTABLE,ENSEMBLE DE REMORQUAGE,CAMÉRA DE RECUL,BLUETOOTH,USB,AUX,SIRIUS,JANTES NOIR ALUMINIUMS 18 POUCES,MARCHE PIEDS,TOILE DE BOITE,BOITE PULVÉRISER,DÉMARREUR A DISTANCE,COMPLÉTEMENT ÉQUIPÉ WOW! 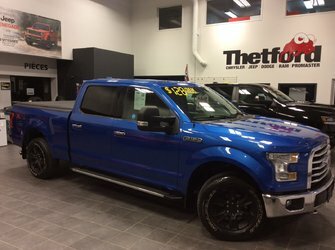 1 PROPRIÉTAIRE,MILLAGE CERTIFIÉ,JAMAIS ACCIDENTÉ,MILLAGE CERTIFIÉ,INSPECTÉ+BALANCE DE GARANTIE FORD GROUPE PROPULSEUR 2020-11-18 OU 100 000KM+ASSISTANCE ROUTIÈRE INCLUS LE TOUT SANS FRAIS+GARANTIE PROLONGÉE DISPONIBLE! NOS CLIENTS SONT DE PARTOUT AU QUÉBEC! LIVRAISON PARTOUT AU QUÉBEC! THETFORD CHRYSLER 45 MIN DE VICTORIAVILLE ,1 H DES PONTS DE QUÉBEC,1H15 DE SHERBOOKE ET MAGOG! Ce véhicule, Ford F-150 XTR/CREW CAB/V8 5L/ 4X4/**127$SEM. ** 2015 1 PROPRIÉTAIRE/MILLAGE CERTIFIÉ/INSPECTÉ/GARANTIE vous intéresse?